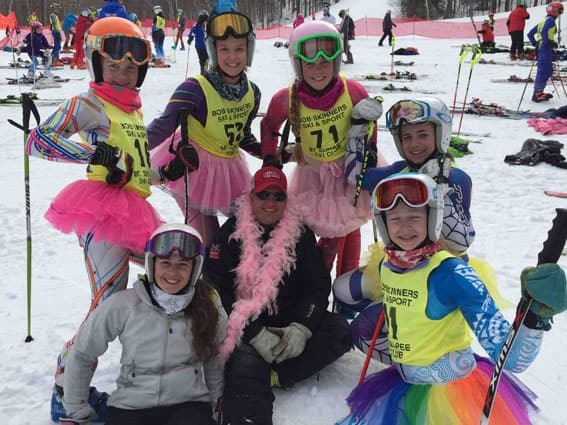 Killington Mountain School U10-U16 athletes competed at Sunapee on March 21-22 for the Chip Gilroy Giant Slalom. Racers from New Hampshire, Vermont, and Massachusetts gathered for this fun, end-of-season event. Families and various clubs set up tents with grills fired up for cooking lunch, and friends gathered around. The weather cooperated, with beautiful sunshine and bluebird skies, and by all accounts, it was simply an awesome, fun day. KMS athletes posted strong results in a huge field with 600-plus athletes participating. Francesca Castellini took second place in the U14 race, with Kai Parlett in second, Sydney Bennett in seventh, and Anja Kroon in 26th. Meghan Bianchi finished fifth for the U10’s, with Shelby Graves in seventh place. In the boy’s U14 race, Aiden Bennett was 13th, Alec Zackin was 14th, and both John Michael Fallon and Zander Hauck had top 30 finishes. Brice Muller won the men’s U10 race, with Connor Roy in fourth, Evan Gras in 16th, and Lukas Sharrock in 18th place. All in all, the event was a great way to cap off a wonderful season in which athletes have learned a great deal, progressed in a multitude of areas, and formed new friendships that will last well beyond time spent on the hill.